Lucy focuses her practice on commercial and residential real estate and corporate transactions. She is experienced in the acquisition and sale of real property; retail and office leasing; asset purchase and sale agreements; commercial lending and finance; corporate formation documents; and foreclosures. Lucy has handled numerous complex commercial real property deals that involve the acquisition and sale of commercial office buildings, retail shopping centers and subdivisions, and unimproved real estate. She has drafted loan restructuring and workout agreements, loan documentation, declarations of restrictive covenants, business formation and organizational documents, and commercial leases. 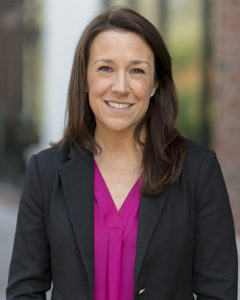 Lucy has been an attorney with Longleaf Law Partners (formerly Morris, Russell, Eagle & Worley, PLLC) since 2005 and has practiced law since 2002. Represented national homebuilder in acquisition of lots in Cary, NC. Represented a regional bank in commercial foreclosures across the state of North Carolina. Drafted declaration of covenants for multiple residential developments. Represented multiple regional and national banks with disposition of REO inventory. Negotiated and drafted pre-foreclosure and forbearance agreements for multiple lenders. Represented commercial landlord in retail lease drafting and negotiation for multiple properties in Wake County, N.C. Represented private equity fund in the acquisition and closing of commercial note secured by a multifamily project in Guilford County, N.C. Drafted multiple loan sale agreements and closed loan sale transactions in excess of $10,000,000.